Virtually every business or organization has some form of online presence. Company websites and social media pages are scouted via search engines, and companies with a dominant online presence—i.e. those that rank highest on search engines—will likely outperform competitors in their shared market space. Ranking highly on search engine platforms is not simply a matter of luck though—optimizing search engine results is often managed by individuals known as search engine optimization (SEO) specialists. These professionals may work for a marketing company, an SEO agency or even on a freelance basis. To learn more about this exciting profession, review the guide below. The overall objective of this role is to boost search engine results for companies, thus improving visibility and subsequently business. SEO specialists will likely work for either an SEO firm or marketing agency, and will usually work on behalf of their organization for multiple clients. The day-to-day tasks can vary, contingent on the organization in question and the years of experience the specialist has. Researching a new client’s online presence. This involves scrutinizing the company website, social media pages and other sites to determine what is working and what is not in terms of website appearance, marketing efforts, brand strategy and so on. The research is then used for comparisons against competitors to ascertain the kinds of marketing approaches that typically fare well in the field. Using analytics platforms to gauge the kind of content and websites that perform well in the market space. Google Analytics in particular can be harnessed to uncover the client’s success in terms of content posting, website visits, social media likes and so on. Using data in this way is crucial as it allows specialists to not only understand what works well, but also develop strategies for future growth and improvement. One of the most fundamental aspects of working in SEO is keyword research. The goal of keyword research is to uncover the kinds of words that customers in the client’s space are searching for, so that those words can then be widely used in website copy and content. A company that produces content rich in keywords will be more likely to rank higher on search engines. Producing website copy or content that is informed by keyword research. This may be tackled by SEO specialists in smaller organizations, although in many cases it will be the duty of a content writer. 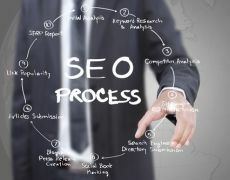 Developing SEO strategies that improve search engine results at both the national and local level. Building reputable links so that search engines continue to prioritize content. This also involves looking at other competitors in the space to gauge what is effective. Monitoring client performance over time using analytics platforms such as Google Analytics, HPE analytics, SAS, etc. Some SEO specialists may even work behind the scenes of a website, altering the code to ensure that the site is able to rank as highly as possible. What qualities make for a great SEO specialist? Ideal candidates for this role will have prior knowledge of marketing, the importance of keyword research and some understanding of data analytics. Payscale explained that a bachelor’s degree is typically required for most entry-level positions, although a master’s degree, particularly in the field of analytics, will likely impress employers and open more career doors. Payscale reported that a position as an SEO specialist is often a starting point for careers in digital marketing. The national median salary, according to the source, currently stands at almost $43,000 per year, although more experienced professionals can command over $64,000 annually. SEO specialists can also progress to roles in higher management, particularly within the marketing industry, Payscale noted. Marketing managers tend to enjoy much higher salaries, with the median national salary for a senior marketing manager standing at close to $97,000 a year. One effective way to kick-start a career in SEO and digital marketing is with a Master of Science in Analytics degree. The online MSA program from Villanova University provides students with a nuanced education in big data analytics—knowledge which can also be applied to a variety of fields. Furthermore, the flexible online nature of the program means that you can study at a time and pace that suits you best. Learn more about the online MSA program from Villanova University.